The pretzels from Fatty Sundays have a twist -- but not the loopy, knotted kind of twist that other pretzels have. Fatty Sundays’ twist is a chocolate and candy dip that adds a sweet topcoat to salty pretzel rods. 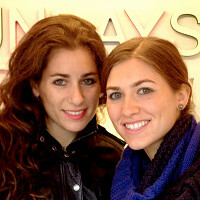 Sisters Ali and Lauren Borowick are the founders of Fatty Sundays. The family business got its name from the Borowick’s tradition of kicking back, relaxing and indulging on Sundays. Everyone pitched in to launch the company: Graphic designer Ali created the brand, Lauren wrote the business plan, and lawyer Risa ironed out the legal details, while the siblings’ parents helped perfect the pretzel recipes and crunch the numbers. Fatty Sundays’ colorful confections are bursting with flavor. The pretzels are made in the Long Island City neighborhood of Queens, N.Y., where they’re hand dipped in chocolate then coated with toppings such as toffee crunch, berry granola, and toasted coconut. Each bite delivers the perfect blend of creamy chocolate, crunchy toppings, and rustic pretzel. It’s easy to imagine noshing on these decadent treats on a lazy Sunday afternoon … or, let’s be honest, every day of the week. Hi, Ali here! My sister, Lauren, and I put a modern twist on the classic chocolate covered pretzel that we enjoyed so much growing up. The combination of unique sweet and salty flavors, texture and crunch will certainly sweeten up your day and keep you coming back for more! I look forward to chatting with you all about our story and pretzels! YUM! It all looks sooo yummy! quick question: there are peanut & nut allergies in the family - I know everyone has their allergy statement - what's yours? Are your products "made in a facility with nuts & peanuts..."? Thank you! oh sorry, Ali! - and other Grommetters.... I failed to jump over to the "Details" page - I just saw the allergy statement at the bottom. Thanks for providing this info for us! Yes, this information is located in the "details" tab. All the products are manufactured in a facility where nuts, gluten and dairy are present. @ Christine Hi! Thanks for checking us out! 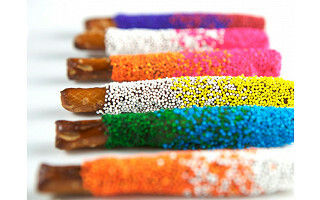 Our flavored chocolate covered pretzels are manufactured in a facility where nuts, gluten and dairy are present. Too bad you have to add that unhealthy palm oil. I'm not familiar with the benefits or detriments of palm oil myself, but Ali will be along shortly and I'm sure she'll address her reasoning behind this choice. @ Lin As a young, new business we do not yet bake our own pretzels. In the future we will take this into consideration when we do get to that point. Thanks for checking us out! Not only is palm kernel oil not healthy it is an environmental detriment as it causes habitat loss and deforestation in the regions where it is grown. @ Suzanne Hi! Thanks for checking out our sale with Daily Grommet. We will be taking this information into consideration in the future. Happy Tuesday all! @ Suzanne & Lin, excuse me naysayers, but you need to update your info. Palm oil and palm kernel oil are only considered unhealthy by those who haven't kept up with the times. Secondly, the palm oil industry has updated it's methods and is now considered an eco-friendly industry. Ms Borowick, congrats to you and your family for getting a business up and running. I will keep your product in mind for future gifts. Good Luck! @Susan Thank you for your good wishes! Let me know if we can be of any help with your gifting needs in the future. The pretzels from Fatty Sundays have a twist -- but not the loopy, knotted kind of twist that other pretzels have. 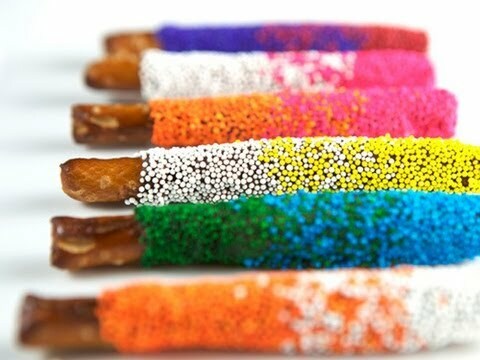 Fatty Sundays’ twist is a chocolate and candy dip that adds a sweet topcoat to salty pretzel rods. Sisters Ali and Lauren Borowick are the founders of Fatty Sundays. The family business got its name from the Borowick’s tradition of kicking back, relaxing and indulging on Sundays. Everyone pitched in to launch the company: Graphic designer Ali created the brand, Lauren wrote the business plan, and lawyer Risa ironed out the legal details, while the siblings’ parents helped perfect the pretzel recipes and crunch the numbers.